Bull Bars, made from aluminium, are an off-road accessory that can be a protective shield for your expensive vehicle, either on the move, or when stationary. Trucks, Cars, SUVs, jeeps bull bars can add to the utility and design of the vehicle and protect your vehicle from any major panel damages in the event of any untoward incidents, like an accident or collision. Everyone wants the best for their car, truck or other vehicle. Unfortunately it’s a fact of life that accidents happen, but it’s not always our fault. To best protect ourselves and our vehicle against life’s little mishaps, it’s always best to take the precautionary stance. Getting a bull bar installed on your vehicle is one of the best ways to drive with confidence, no matter where you’re going. A bull bar reduces some damage during impact, but it also acts as something of a buffer to offer some defence to the vehicle’s occupants. At Barworld, we are the truck bull bar, custom bull bar, ute tray ladder bar and vehicle accessory specialists, with years of experience to install your bull bar quickly, professionally and efficiently. Bull Bars from Barworld are fabricated from strong and robust material to protect your expensive vehicle from major panel damage. It allows you to breeze through the city areas or country roads knowing you have that added protection to the front of your vehicle. Barworld Bull Bars are available for any make and model of truck from Nissan and Mitsubishi to Mercedes and Volvo. The best custom designs from experienced fabricators of the company provide protective shield suited for the vehicle. Our engineers have worked hard to develop the best bull bars for your needs. You can rest easy knowing your truck is in good hands when you bring it to us for your bull bar repairs or installation. Arrange to get your truck bull bars installed with Barworld today! Having the best protection for your truck has never been easier. If you have any questions about how a bull bar will be beneficial for your truck, please get in touch with us. 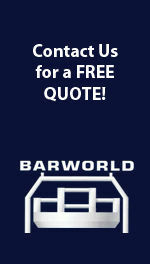 Call 0413 714 475 or mail us at adrian@barworld-vic.com.au for a quote.